I love this new machine in 2017 (although can't help feel a bit guilty as the cost would've covered paying someone to quilt all the quilts I'll make in my life, maybe-- we'll see -- And my neck starts aching, even though truly, I do enjoy it! It has a laser that you "draw' follow lines on your design on a paper on the back and it quilts the design onto your quilt. 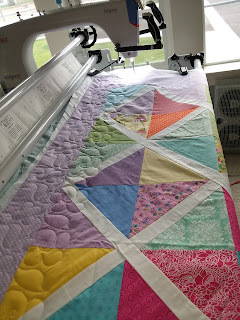 This section is to document my progress, ups and downs, with my Sunshine 16 midarm quilting machine. Sunshine did a great job on this one! 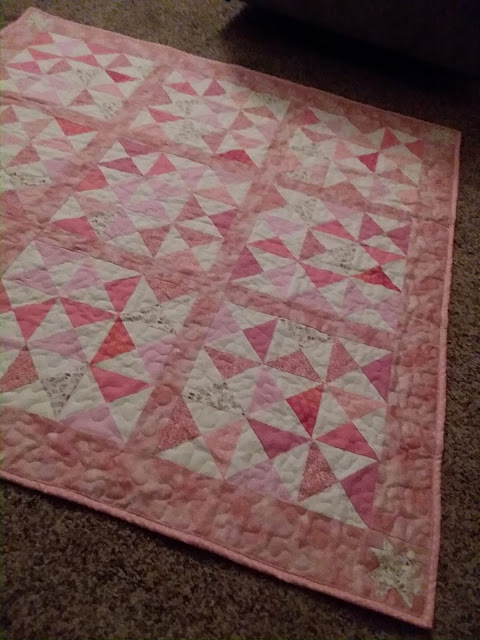 I thought I broke my old Sunshine 16 but somehow it ended up quilting better than it ever had before! Update Sept 2015-- I just sent this email to someone and thought it may be helpful so am publishing it here. 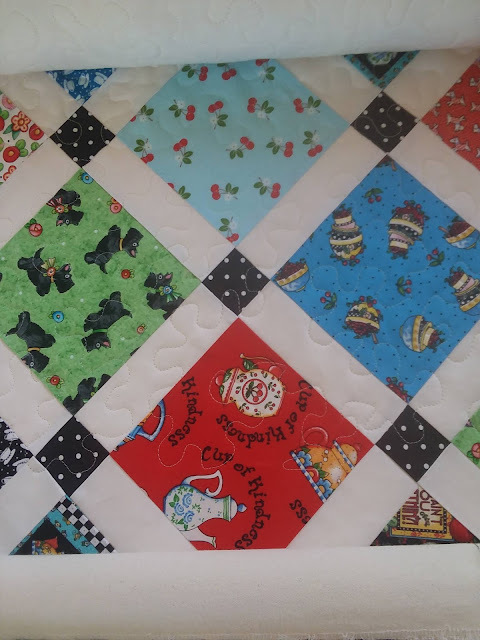 Hi --------, I have very little experience on other quilting machines so can't compare. I had quite a negative experience with my machine at first, but with time, practice, perseverence, and patience, I'm happy with it now. 2. Thread kept breaking or shredding. This was horrible because I had to constantly rethread and it took so many more hours. 1. I took a few classes from a local shop on a different brand machine which was somewhat helpful. 2. A lady on the sunshine 16 yahoo group let me come to her house and gave me some pointers which were use Glide thread and don't move the machine so fast and try to move at an even pace. 3. I've also learned to listen as I quilt and notice certain sounds which key me in if that loop comes unthreaded or to check to see if the stitching is good. Ideally if money were no object I'd prefer one that is automatic as even if the process goes smoothly, its still time consuming and a lot of strain on the neck and shoulders, but then again if money were no object, I'd take my quilts to a quilter because they do such beautiful work! Swirly quilting in the negative spaces. Update: August 2014-- Since I visited Ronna (another Sunshine 16 owner) I have been doing much better. One of the main helps is using Glide thread and sewing slower. I've also learned to load and adjust my quilts better on the frame. 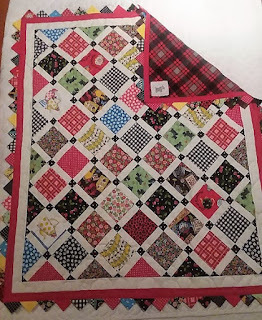 There is definitely a big learning curve when learning to quilt on a midarm machine on a frame. 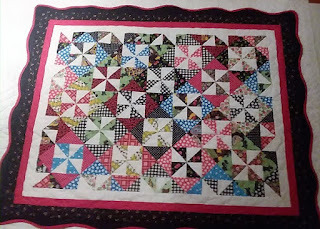 The price was inexpensive and I've actually quilted a lot on it-- but also been vexed, irritated, stressed... so far I've persevered, but can't say I've come anywhere near mastering this machine. update-- I'm doing much better and because I'm quilting more (due to less problems) hopefully I'll continue to gain expertise. So excited to get my new machine in the mail. April 2012. It was tricky setting up the frame. Luckily I had some help. Practicing, practicing and very antsy to start quilting real quilts. Not bad for first try on a real quilt. 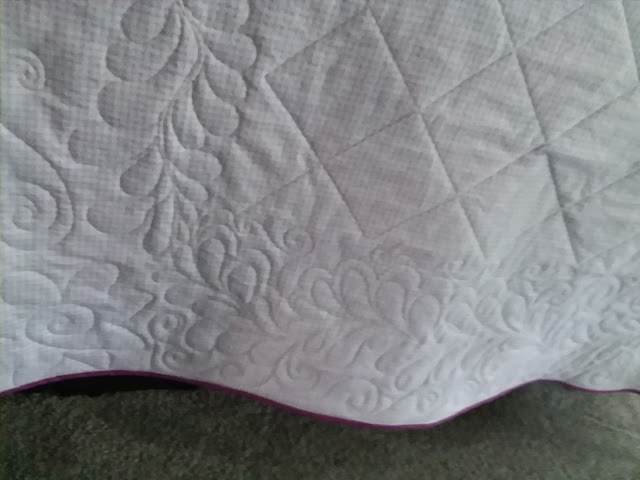 There are so many variables that can mess up your quilting: thread, frame poles (--not too high, not dragging on your machine), TENSION, even my backing fabric-- it seems if I use cheaper fabric, it doesn't work. 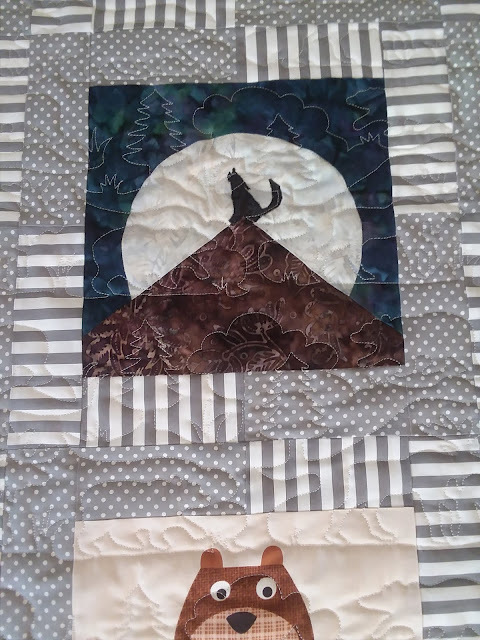 It's so exciting to be quilting my first big quilt! 2. Despite having to pick out a lot of bad stitches, and having to rethread very frequently, the finished product while extremely flawed, doesn't really show the flaws and still looks beautiful! I wanted to stitch hearts and swirls, but again, it was only the meandering stitch that would work. More repeated picking out. Luckily the meandering stitch is a wonderful quilting stitch. 3. 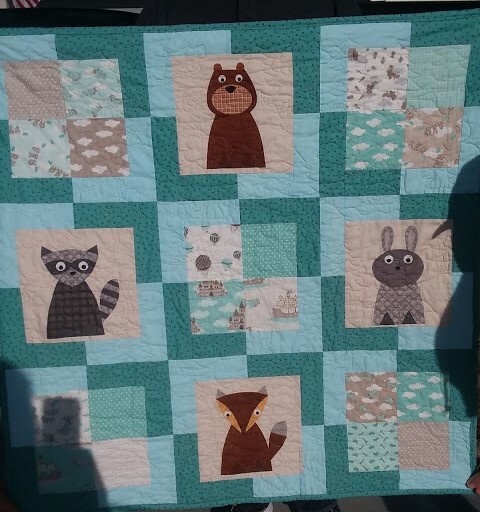 This quilt was made for my daughter. 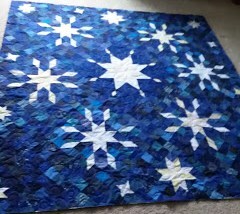 On this quilt, I tried quilting circles, but no matter what, I couldn't get it to stitch without problems. I picked it out over and over, changed threads repeatedly, messed with the tension and finally changed the backing fabric and went back to the meandering stitch. 4. And once again, the finished product was pretty forgiving of all my errors. Again I tried to do something a little more creative and had some success. 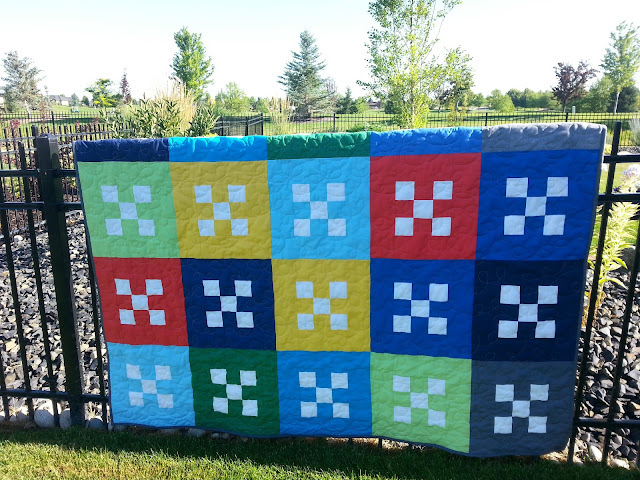 The stripes made a natural boundary in which to quilt different designs. 5. I've enjoyed this quilt a lot. 6. Made as a gift. I did the borders on my domestic machine with a conch shell design. 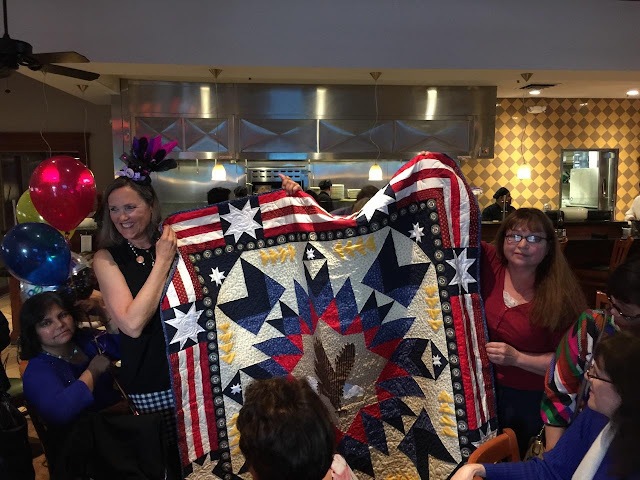 I'm always most worried about giving away quilts with the flaws and hope that they aren't too noticeable. 7. A gift for my niece. 8. I sewed some scallop stitching along the scallop border on the domestic machine (I'm not completely satisfied so put it away for now). I may sew yoyos as shown. 9. A gift for my sister in law. A fishing themed triangle quilt made for my husband's birthday. With a little helper who also likes fish! 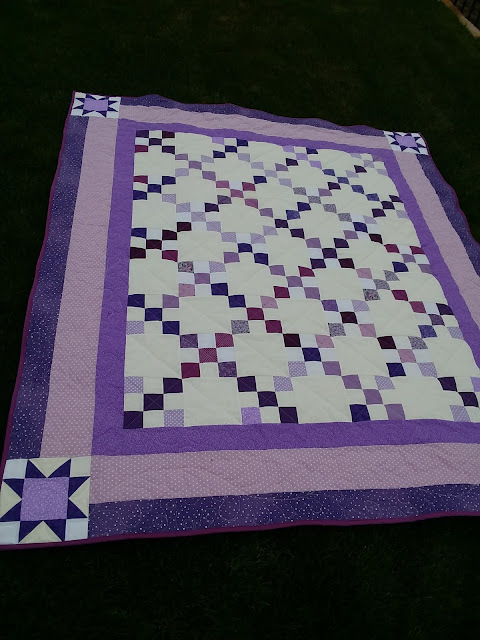 Love your quilts, where did you get the pattern for your daughters heart quilt? update from June 26th, I have concurred this thing. Totally have fixed it so it don't break thread or skip stitches. One I changed my thread type. Have gone to GLIDE, added a couple loops to keep the thread from whipping and catching on the tension spring. On the upper "pre" tensioner I got rid of the tiny disks and replaced them with ones the size of a quarter and got a stiffer spring like the lower tensioner. Built my own handles for it. 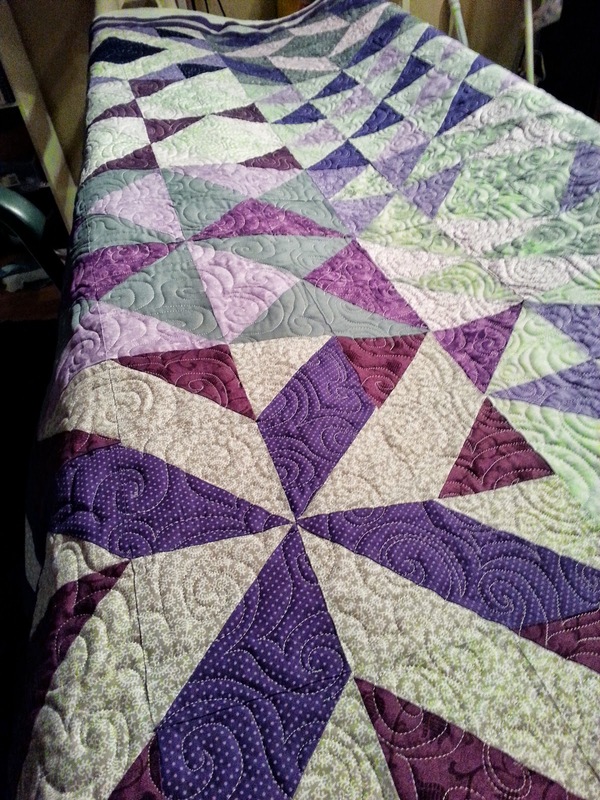 Now I'm quilting like crazy!!! I had the Sunshine 16 for a couple of years. Had numerous problems. Got things fixed, then all of a sudden I am having tension problems. First, it would not sew at all, purchased new bobbin cases. Thread keeps breaking. Anything would be appreciated. My email is fwiginton2windstream.net. Thanks!